FIFA has been sitting on the footy games throne for a fair few years now, with little or no competition of note, but it could very well be replaced this year. We've played PES 2017 and it is good. Scrub that, it is superb. Considering we've only had access to a first-look build so far, that's a bold statement. But we did have hours with it, amounting to around 13 to 14 matches, so feel comfortable that we've seen a lot of what it has to offer. On the pitch at least. The preview build offered exhibition matches for one or two players, using any of four teams: France, Germany, Atletico Madrid and Arsenal. We played with all of them many times, and in both single and two-player versus games, so have experienced all the options available to us at this stage. Naturally, that means that we didn't get to see the main user interface, other modes or the overall presentation, but all of the new in-game features were present, so have a good understanding of the most important aspects of any football game. 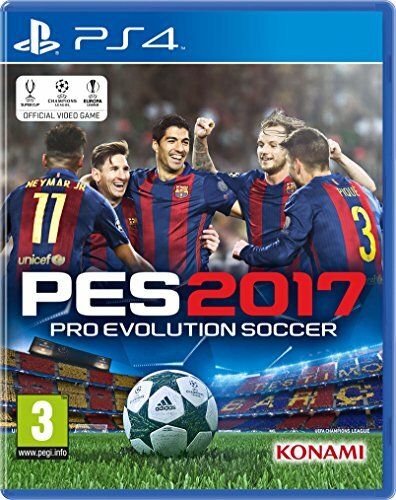 And it is here that PES 2017 excels. Pro Evolution Soccer 2016 was a significant return to form for a series that had lost its way in recent years, but this year's game steps up several gears more. Graphics are so much better it looks like a different game entirely. Konami has now fully employed the Fox Engine for all in-game effects. This has resulted in far better player models, with lifelike physical attributes and faces. In addition, stadiums and crowds are better defined and animated, while things that FIFA fans now take for granted - such as graphical deterioration of the pitch as players slide and scrape across it - have made it to PES. There are also small touches that, when added up, make the experience more rich than ever before - breath from players' mouths on a cold day, water droplets coming from the nets as the ball hits them, that sort of thing. In short, this PES finally takes on FIFA in the looks stakes. And that's without compromising on the speedy, fluid gameplay that made the series famous to begin with. PES 2017 is fast and fun, as before, but also has realistic ball physics this time out to add realism. In addition, animations of players - goalkeepers especially - not only make the game look better in motion, but have a distinct effect on control and shot stopping. The goalies, for example, now pull off a much larger variety of saves - from one-handed blocks to spectacular, twisting leaps. They can also make multiple saves in the same attack, something not likely in previous iterations. They can bounce to their feet to save a follow-up attempt and more. The new animations go hand-in-hand with better artificial intelligence - again, for ‘keepers especially. Different goalies have different attributes, generally matching their real-life counterparts. Petr Cech, for example, is far more likely to stay on his line, while Manuel Neuer will rush out a bit more often. AI improvements don't stop there. An all-new feature added to PES 2017 is adaptive AI, where the computer is constantly learning how you play during a match and will adapt its own tactics and movements to counter your most regular traits. If you favour a winger too much, it will start to put more men on him. Or if you try through balls too often, defenders will position themselves better to cut them out. In single-player this makes a game ebb and flow much more like real football, where you require different strategies in order to take or maintain a lead. In practice, it works superbly. We constantly found ourselves having to switch the way we play as matches progressed, even changing set tactics and formations completely. Thankfully, a few new tactics have been introduced that you can assign to D-pad directions. Tiki Taka and Gegenpressing are two of the more modern real-world styles that have been added. They each make a big difference to how your players respond around the pitch and the latter is hilarious play with and against as players swarm around the man with the ball. Corners also now afford more control and tactical options. Pressing the D-pad left at a corner brings up four orders for your players to undertake, including crowding the six-yard box, which we found to be very effective against computer and human opponent alike. A complete reworking of the first-touch system, called real touch, makes keen control more important. And seasoned PES players will savour a more precise passing system. In short, this is a game by fans for fans, without little spared. Everything a PES loyalist could want seems to have been implemented, but without alienating newbies. And we get all this from just a first-look match build. Amazing. There's no doubt that the years in the wilderness, where the games were not of the standard expected, hurt Konami. However, rather than giving up, the development team has learned from its mistakes and is well underway in presenting a Pro Evolution Soccer as good as the much-loved PES 6. High praise indeed. It's worth noting that we've only played exhibition matches, without seeing MyClub or any of the other game styles set to be on offer. And although some teams have been fully licensed, the vast majority will once again be made up and require third-party patching. But it totally gets the basics right. PES 2017 presents a fantastic game of football, the sort that will have you and your friends wailing with laughter and banter - as it did us, during our gameplay session. We left with massive beaming smiles. As did Konami, because it knows it's finally backing a winner.